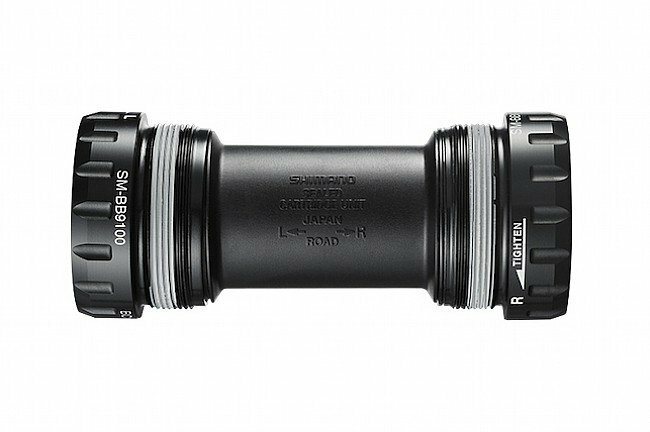 The Shimano Dura Ace BB-R9100 Bottom Bracket shares the same performance enhancing features as the previous 9000-series bottom bracket, using small diameter bearings to shave weight, reshaping the cones for better durability, and improving the seals to reduce friction while maintaining the same water and debris resistance. Available in English-threaded 68 mm shell and Italian-threaded 70 mm shell-width versions. Includes TL-FC24 adapter for use with standard external bottom bracket tools designed for 44 mm OD cups. Compatible with the 24 mm spindles found on Hollowtech II cranks. Claimed weight is 65 g.
Dura Ace, the only way to fly. Like all Shimano Dura Ace gear, its top of the line. I was a bit surprised after installing it that the bearings seemed a little tight....not as free spinning as I'd expected.That said, it is very smooth. I expect that the bearings will ease up as I get more miles on them. I was replacing an old 7800 BB and that would have been impossible without the accompanying adapter. Not all sellers provide that adapter but they did. Thanks! Installed for my Dura Ace 7800 crankset. Installs easily, silent and smooth. Replaced my DA 7900 BB which had aftermarket ceramic hybrid bearings installed. The no load spin test is impressive. Real world, the Dura BB 9100 (or 7900 or 9000) is much better - smoother, quieter, less friction - yes folks... ceramics are not the best for low rpm (less than 10,000) applications. Ceramic hybrids wear poorly and create slop, noise, and increase friction. After several experiments and years of trying ceramic hybrid bearings, I'm sticking with DA stock (BB, derailleur pulley, and wheels).